It’s so much fun. A just have activity when coming to Okinawa. 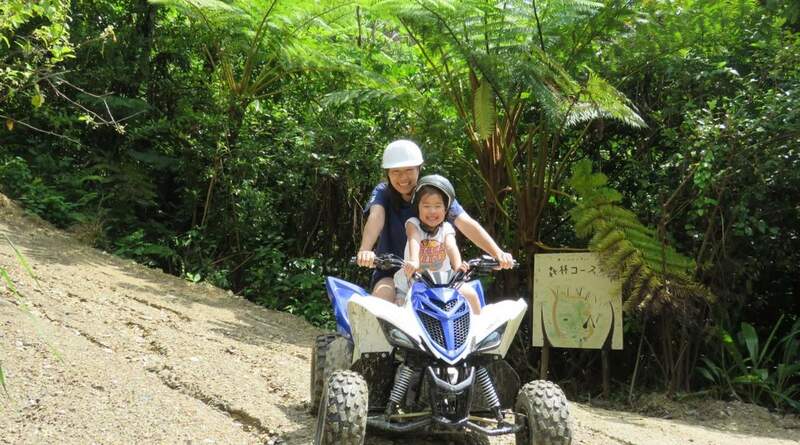 Discover the natural beauty of Okinawa on the back of a four wheel ATV that promises lots of fun for the whole family! 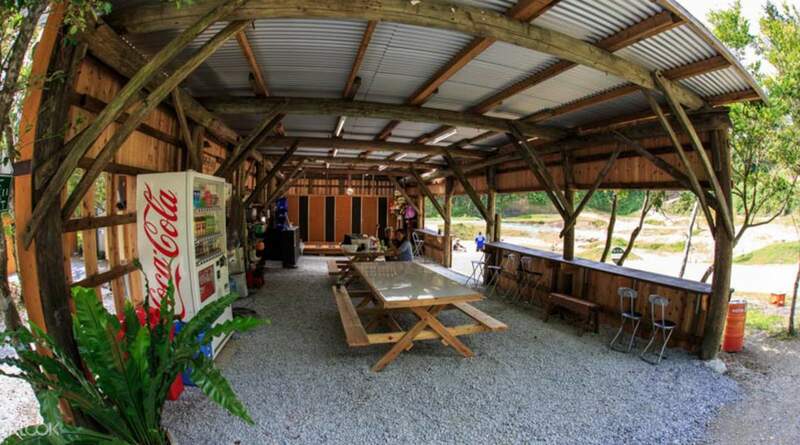 Upon arrival at the site, you will be provided with a safety instructions by a coach. 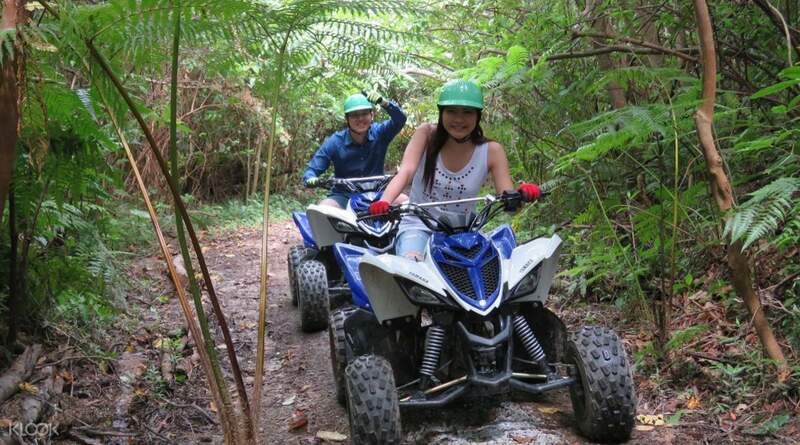 You will also be given a crash course how to handle your ATV, which requires no special license. Your first ride will be through a mountainous terrain so be prepared for lots of flutters in the belly from bumping up and down the dirt roads. Next, you will ride through a lush forest with little wildlife scurrying around you. 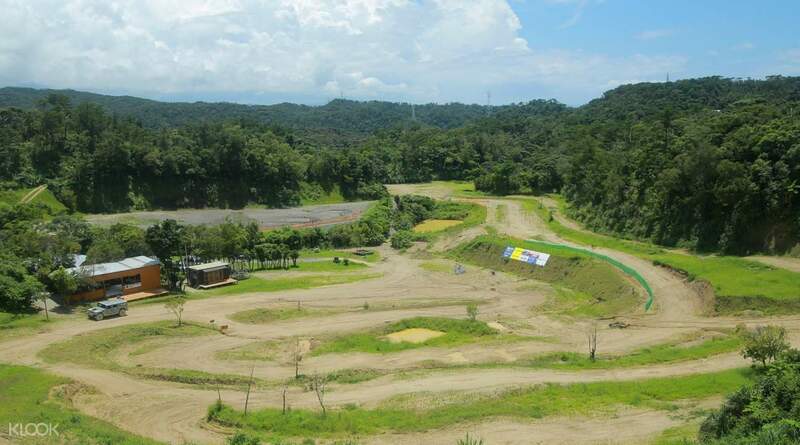 Opt for the extra value course and get driven in a powerful Hummer SUV through sand and stones. At the end of your experience, you will unwind by going for a serene stroll through the green forest while surrounded by the relaxing sounds of chirping birds. Surprise activity in the jungle, I shall not say, book it and you will know what I meant. We are a family of young and old, from 4 to 70, this activity is fun for the family. Our guide was awesome and the area is not difficult to find, GPS works very well in the area. Follow signs and you will get to the location. Toilets are clean, amenities are plentiful. Clothings for change, wellies (boots) are arranged for your activity. I cannot ask for more. Surprise activity in the jungle, I shall not say, book it and you will know what I meant. We are a family of young and old, from 4 to 70, this activity is fun for the family. Our guide was awesome and the area is not difficult to find, GPS works very well in the area. Follow signs and you will get to the location. Toilets are clean, amenities are plentiful. Clothings for change, wellies (boots) are arranged for your activity. I cannot ask for more. This was so much fun! My husband and I took our 4 year old son, and we all had such a blast! Our guide, "Sushi" was awesome and so much fun. They took us through their dirt track course several times to get comfortable with everything, then we took a little jungle hike with some nice cold tea to give us a nice little break, and then onto the jungle course! It was raining when we first arrived, but they geared us up with rain pants, a poncho and rain boots, as well as offered us a change of clothes (Yambarunture shirts and pants!) to wear on the courses if we desired, too! We needed this because the course was MUDDY! But it made it so much fun! Sushi was lots of fun, very upbeat, but also made sure we were all comfortable and safe. I would HIGHLY recommend! This was so much fun! My husband and I took our 4 year old son, and we all had such a blast! Our guide, "Sushi" was awesome and so much fun. They took us through their dirt track course several times to get comfortable with everything, then we took a little jungle hike with some nice cold tea to give us a nice little break, and then onto the jungle course! It was raining when we first arrived, but they geared us up with rain pants, a poncho and rain boots, as well as offered us a change of clothes (Yambarunture shirts and pants!) to wear on the courses if we desired, too! We needed this because the course was MUDDY! But it made it so much fun! Sushi was lots of fun, very upbeat, but also made sure we were all comfortable and safe. I would HIGHLY recommend! It’s been a wonderful experience. Had a blast with my 5 yr old. The coach went extra mile to show us how to drive the 4 wheel and he let my LO fed the goat as well. No need to worry about the clothes, they provide jumpsuit and boots, so pretty much all covered. It’s been a wonderful experience. Had a blast with my 5 yr old. The coach went extra mile to show us how to drive the 4 wheel and he let my LO fed the goat as well. No need to worry about the clothes, they provide jumpsuit and boots, so pretty much all covered. Very good experience. There are much details in the voucher and clearly stated where to go (with mapcode). The activity itself was fun, the staff and coach there were very friendly and helpful. Besides, they supply clean suit for playing. Overall experience was excellent and highly recommended. Very good experience. There are much details in the voucher and clearly stated where to go (with mapcode). The activity itself was fun, the staff and coach there were very friendly and helpful. Besides, they supply clean suit for playing. Overall experience was excellent and highly recommended. The whole experience was well planned and designed, and we got to try out different trails and with the short nature walk, it was a very enriching and fun experience that we will recommend for everyone going to Okinawa! The whole experience was well planned and designed, and we got to try out different trails and with the short nature walk, it was a very enriching and fun experience that we will recommend for everyone going to Okinawa! Amazing experience on ATV driving in the bumpy jungle. Nice and helpful services provided there and the leader played some ATV tricks with my kid to make him an unforgettable experience! Highly recommended. Amazing experience on ATV driving in the bumpy jungle. Nice and helpful services provided there and the leader played some ATV tricks with my kid to make him an unforgettable experience! Highly recommended. It's very exciting and funny!!! !And the trainer is very nice and humor!!!! !The jungle is cool and amazing,everything is wonderful ! !And clothes and shoes are really clean!Very good experience for me!Thank u and see u!!! It's very exciting and funny!!! !And the trainer is very nice and humor!!!! !The jungle is cool and amazing,everything is wonderful ! !And clothes and shoes are really clean!Very good experience for me!Thank u and see u!!! My family of 10pax (with 2 kids) love this ATV experience so much. It was fun and everyone enjoy it. The instructor was very kind and nice all the way. It is a MUST TRY experience if you go Okinawa. My family of 10pax (with 2 kids) love this ATV experience so much. It was fun and everyone enjoy it. The instructor was very kind and nice all the way. It is a MUST TRY experience if you go Okinawa. We had great fun! The guide very attentive and took good care of us even my mother in Law who wasn’t playing the atv. He make sure she is well settled while waiting for us. Very caring and humorous guy. Worth going for it! We had great fun! The guide very attentive and took good care of us even my mother in Law who wasn’t playing the atv. He make sure she is well settled while waiting for us. Very caring and humorous guy. Worth going for it!